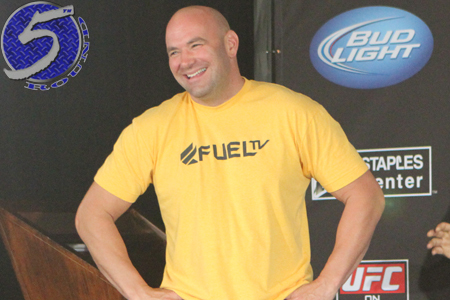 UFC president Dana White (pictured) hosted another one of his infamous media scrums Friday after the UFC Fight Night 46 weigh-ins. White touched on a number of topics, including the ruckus Conor McGregor has generated this week in his hometown, Monday’s meeting with Gina Carano, UFC middleweight champ Chris Weidman going to Vitor Belfort’s backyard to defend the title (yeah…), Nate Diaz’s lack of starpower and much more. UFC Fight Night 46 takes place Saturday inside The O2 in Dublin, Ireland. UFC Fight Pass streams the entire card live bright and early in America at 12:30PM ET/9:30AM PT.